Former Florida Gov. Jeb Bush tells Newsmax that the GOP must broaden its appeal to avoid becoming "the old white-guy party," and recommends that Republicans create a "shadow government" to engage Democrats on important issues as the incoming Obama administration seeks to enact its agenda. In a wide-ranging interview with Newsmax, the popular former governor and younger brother of President George W. Bush said the 2008 election was neither "transformational" nor a landslide. For example, he noted that Barack Obama's significant fundraising advantage over John McCain played a key role in Democratic success this year. "If you take the [last] two election cycles, there's real cause for concern, no question about it," he said. There is good news for Republicans, Bush said: The United States remains "basically a center-right country." He cited President-elect Barack Obama's stance on taxes as an example. The party should establish a loyal opposition and "organize ourselves in the form of a shadow government" that would address key issues, providing the public with "a loftier debate about policy" rather than mere partisanship. Re: Jeb Bush: GOP Should Set Up "Shadow Government"
Please God no more Bushies as president. Enough damage has been done. And Jeb may be the worst, he is smarter than W and therefor may be more dangerous. Jeb's main backing has been the Miami anti-Cstro Cubans, many of whom are linked both to drug trafficking and CIA black ops. Jeb has been friendly with men like Orlando Bosch (who may have been photographed in Dealy Plaza on 11/22/63) and Louis Posada, both terrorists who blew up a civilian airliner. 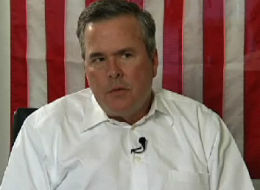 Jeb Bush needs to shut the f**k up and help his retarded brother to overcome his cocaine and male prostitue addictions. ohh, wait....... by 'retarded brother' do you mean Dub'yuh or Marvin? Is this related to Sean Hannity's constant, annoying references to "Conservatism in Exile?" I hate to say it, but remember how Santiago said that "Those who do not learn from history are doomed to repeat it?"